Prince Eugene, the most famed of Austrian generals, was the son of Eugene Maurice of Savoy (by the mother's side Count of Soissons) and of Olympia Mancini, niece of Cardinal Mazarin. His father intrigued, and was banished from the court of France; and his mother also quitted Paris not many years after, suspected of many vices of which she was very probably innocent; and guilty of a thousand follies, which were more strictly scrutinized than her crimes. Eugene was originally destined for the Church, and, according to a scandalous custom, then common in France as well as other Catholic countries, he obtained several benefices while but a child, of which he was eager to divest himself as soon as his mind was capable of discriminating between one profession and another. 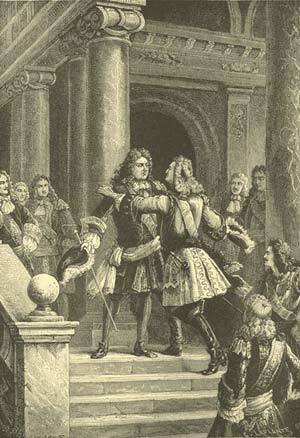 He seems soon to have felt within himself that ardent desire for military service, which is sometimes a caprice and some times an inspiration; but Louis XIV., at whose court he still remained, positively forbade his throwing off the clerical habit, notwithstanding all the entreaties of the young abbe, and by so doing, incurred the enmity of one who inherited from his mother no small faculty of hatred. At length, various circumstances with which he was in no degree connected, brought about a change in the affairs of Europe that afforded him an opportunity of escaping from the restraint placed upon his inclinations, and of turning the genius they had despised against those who had contemned him. France and Austria had long been either secretly or openly at strife; but now the dilapidated state of the German empire, after tedious and expensive wars, together with the combination of external foes and internal insurrection, threatened the nominal successor of the Roman Caesars with utter destruction. The Hungarians in revolt, joined with the Turkish forces which they had called to their assistance, marched into Germany and laid siege to Vienna. Louis XIV. had hitherto taken care to foment the spirit of insurrection, and to aggravate the more pressing dangers of Germany; but at this moment, to cover the encouragement he had held out privately to the rebels, he permitted the nobility of his court to volunteer in defence of Christendom, which the fall of Vienna would have laid open to Infidels. A large body of young men set out immediately for Austria, among whom Prince Eugene contrived to effect his departure in secret. The famous, but unamiable minister Louvois, when he heard of the young abbe's escape remarked with a sneer, "So much the better, it will be long before he returns." The speech was afterward repeated to Eugene, who replied, "I will never return to France but as a conqueror;" and he kept his word, one of the few instances in which history has been able to record that a rash boast was afterward justified by talents and resolution. On arriving at Vienna, Eugene cast away the gown forever, and his rank instantly procured him a distinguished post near the person of the Duke of Lorraine, then commanding the imperial forces. Shortly after he had joined the army, John Sobieski, the valiant King of Poland, advanced to the assistance of the emperor, and the Turks were forced to raise the siege of the Austrian capital. In the campaign that followed against the Infidels, Eugene distinguished himself greatly, both by a sort of light unthinking courage, and by a degree of skill and judgment, which seemed to show that the levity he was somewhat too fond of displaying, though perhaps a confirmed habit from his education in an idle and frivolous court, was no true type of the mind within. It was the empty bubble dancing on the bosom of a deep stream. This was felt by those who surrounded him; and promotion succeeded with astonishing rapidity. Before the end of three months he was in command of a regiment of horse. Prince Eugene and the Marshal de Villars. Continual battles, sieges, and skirmishes, now inured Eugene to all the hardships and all the dangers of war, and at the same time gave him every opportunity of acquiring a thorough knowledge of his new profession, and of obtaining higher and higher grades in the service. In the course of a very few years he had been wounded more than once severely; but at the same time he had aided in the taking of Neuhausel, Vicegradt, Gran, and Buda; was the first who entered sword in hand into the intrenched camp of the Turks at Hersan; and had received a commission as Lieutenant-general in the Austrian service. The storming of Belgrade was the next great event in which Eugene was called to act; and here, in command of a body of reserve, he attacked the walls, after the first parties had been repulsed, and succeeded in forcing his way into the city. The regiments which had failed at first now rallied; and the path being open, the Imperial forces poured in in all directions, and Belgrade was taken after a most obstinate defence. Victor Amadaeus, Duke of Savoy, was shortly after this persuaded by his cousin Eugene to embrace the interests of the house of Austria; and to enter into the great alliance which had been formed for the purpose of depressing France. The vast power which Louis XIV. had acquired, and the evident disposition he displayed to extend that power to the utmost, had armed the fears of all the monarchs of Europe against him. At the same time, the armies which had conquered for him were dispersed, and the generals who had led them to victory had in most instances fallen into the grave. Perhaps these considerations might lead the Duke of Savoy to withdraw from an alliance which promised little support, and eminent danger; but he had soon reason to repent of having done so. Marshal Catinat, the best of Louis's living officers, was ordered to act against him; the whole of Piedmont quickly fell into the hands of the French; and on August 18th the duke was completely defeated by the adverse general. Eugene, who was present, though wounded with a spent ball, covered the retreat of the troops of Savoy; but the battle was nevertheless completely lost, and influenced for long the fate of Piedmont. After various campaigns in Italy, where little was effected but a diversion of the French forces from his scene of war in Germany and the Netherlands, Eugene prevailed upon his cousin the Duke of Savoy, to lead his troops into France and to draw the French army from Italy, by carrying the war into their own country. The scheme was a bold one, but it proved most successful, and Embrun, Quilestre, and Gap, having fallen, the allied army, under Victor Amadaeus and Eugene, advanced rapidly into Dauphiny. Terror and consternation spread before them; and in revenge for the devastation committed by the French in the Palatinate, they now ravaged the whole of Dauphiny, burning the villages and hamlets, and laying the cities under heavy contributions. The heart of France was open to the invading army; but, fortunately for that country, a severe illness put a stop to the proceedings of Victor Amadaeus. Returning to Turin in haste, he left his army to the command of Prince Eugene; but the Italian generals contrived, by hesitation in their obedience, and opposition to his wishes, to defeat Eugene's best schemes, so that he was glad, by a rapid retreat, to bring his army in safety to Savoy. Eugene was now created Field-marshal; and received the order of the Golden Fleece; but his gratification at these marks of approbation was bitterly alloyed by a severe defeat which he suffered near Pignerol, in company with his cousin the Duke of Savoy, who madly engaged the French forces in a position where his own discomfiture was a certain consequence. Few movements of any import took place in Italy for some years after this, in which Eugene was concerned. Victor Amadaeus, partly from caprice, partly from fear, withdrew from his alliance with Austria, and, once more signed a treaty of neutrality with France. The Imperial troops, unable singly to keep the field against the French, abandoned Savoy; and Eugene, though his efforts had proved unsuccessful, was received at Vienna with the highest distinction. The emperor, probably judging rightly in this instance, that the prince had failed from his energies being crippled by a divided power, now gave him the sole command of the army opposed to the Turks in Hungary. Eugene immediately found himself menaced by the whole force of the Turkish Empire; but after some masterly manoeuvres he saved the city of Peterwaradin, on which the Ottoman forces were marching; and then, though with very inferior power, approached the intrenchments of the Grand Vizier, at Zeuta, with the intention of forcing him from his camp. At the very moment, however, that the army had advanced too far to retreat, a courier arrived, bearing the emperor's commands to Eugene, on no account to risk a battle. Eugene's measures were already taken; he put the letter in his pocket, attacked the Turks, defeated them completely, left twenty thousand Mussulmen dead on the field, and ten thousand drowned in the Danube; pursued his victory by burning Serai and securing the frontier line of fortresses, and then returned to Vienna in expectation of reward and honor. The emperor received him coldly, and before the day was over he was put under arrest for disobedience of orders. The clamor, however, of the people, and some feeling of shame in the bosom of the proud, weak Leopold, soon caused him to restore Eugene to his rank, and to send him once more against the Turks. Success, however, did not follow the prince through the succeeding campaign; and before the season brought it naturally to a close, peace had been determined on between Austria and the Porte. Some time previous to the period of which we now speak, Louis XIV. had endeavored to tempt Eugene back to his Court, by the offer of a Marshal's rank in the French army, the government of Champagne, and a considerable yearly pension. Eugene, who felt that, however flattering to himself, the offer originated alone in the selfishness of an ambitious monarch, refused it in terms sufficiently galling to the proud King of France. Nevertheless, after the peace of Westphalia, Villars, who was sent as ambassador to Vienna, is supposed to have been again charged with a mission of the same nature to Eugene. The fact, however, is not only doubtful, but very improbable, from the character of all parties concerned. Eugene was not a man to leave himself the possibility of changing; Louis was not a man meanly to solicit where he had once been refused; and Villars was not a man to undertake a mean commission, even for a king. It is probable that the courtesy which the prince evinced toward Marshal de Villars from a sense of his personal merit, at a time when the haughty Court of Vienna was mean enough to treat even an ambassador with cold disrespect, was the sole origin of the report. However that might be, Eugene remained for a length of time at Vienna, filling up his inactivity by trifling with many arts and many enjoyments, till at length the War of the Succession, as it was called, breaking out, he was appointed to the command of the army in Italy. At length a general engagement took place at Luzara, at which Philip of Spain was present. The forces of the French have been estimated at forty thousand, those of the Imperial general did not much exceed one-half that number. The battle was long and fierce; and night only terminated the contest. Both parties of course claimed the victory. The French sung a Te Deum, but retreated; the Imperial army retained their ground. Nevertheless, the fruits of victory were gathered by the French. Their immense superiority of numbers gave them the power of overrunning the whole country; and the Imperial court, either from indolence, heedlessness, or intrigue, failed to take any step to support its arms in Italy; so that all which Eugene had taken, sooner or later fell into the enemy's hands, and he himself, disgusted with the neglect he had met with, left his army under the command of another, and set out to see whether he could not procure some reinforcement, or at least some supply of money to pay or provide for his forces. At Vienna he found good reason to suspect that Count Mansfield, the minister of war, had by some means been gained to the interest of France. But, in the meanwhile Eugene was appointed minister of war; and sometime after, in this capacity, proceeded to confer with Marlborough on the united interests of England and Austria. This negotiation was most successful; and here seems to have been concerted the scheme which Marlborough afterward so gloriously pursued for carrying on the war against France on the side of Germany, and of thus freeing the Empire. In a military point of view, also, Eugene's efforts, though supported by no great army, and followed by no great victory, were wise and successful. He foiled the Hungarian rebels in their bold attack upon Vienna, checked them in their progress everywhere, and laid the foundation of their after subjugation. Soon after this, Eugene took the command of the Imperial army on the Rhine; and after considerable manoeuvring singly, to prevent the junction of the French army with that of the Duke of Bavaria, finding it impossible, he effected his own junction with the Duke of Marlborough, and shared in the glories of the field of Blenheim. Eugene was here always in the thickest of the fight, yet never for a moment forgot that he was called upon to act as a general rather than a soldier. His operations were planned as clearly and commanded as distinctly in the midst of the hottest conflict, as if no tumult had raged around him, and no danger had been near to distract his attention; yet his horse was killed under him in the early part of the battle; and at one moment, a Bavarian dragoon was seen holding him by the coat with one hand, while he levelled a pistol at his head with the other. One of the Imperialists, however, coming up at the moment, freed his general from this unpleasant situation; and Eugene proceeded to issue his orders, without the least sign of discomposure. The following year Eugene returned to Italy, and once more began the war against Vendome. Notwithstanding all his skill and activity, however, the superiority of the French numbers, and the distinguished military genius of their chief, prevented Eugene from meeting with any very brilliant success. He surprised various detachments, relieved several towns, was successful in many skirmishes; but he failed in drawing the French out of Savoy, and was totally repulsed in endeavoring to pass the Adda. In the attempt to do so, many men and several valuable officers were lost on both sides. The battle was long and furious. Both Vendome and Eugene displayed all their skill to foil each other; and perhaps so bravely contested a field was as honorable to each as a great victory. Neither, however, could fairly claim the battle as won; for though Eugene failed in passing the river, the French were the greatest sufferers in the contest, and they did not succeed in compelling the Germans to fly, though they prevented them from advancing to join the Duke of Savoy. Eugene, with his wonted reckless courage, exposed himself more than even was necessary, and in the very commencement of the engagement was wounded severely in the neck, notwithstanding which he remained a considerable length of time on horseback, till a second musket-ball, in the knee, forced him to absent himself for a time from the field. These wounds probably decided the failure of his attempt; but they did not prevent him from securing his army in good winter quarters, and checking all active operations on the part of Vendome. The next campaign was more successful. Vendome, after defeating a body of Imperial troops at Calemato, was recalled, and the command of the French forces given to the Duke of Orleans and the Marechal de Marsin, who with an army of eighty thousand men invested Turin, the last hold of the Duke of Savoy. Eugene immediately marched to form his junction with the duke; and no longer opposed by the genius of Vendome, passed the Adige unattacked, crossed the Tanaro, and the Po, joined his cousin near Carmagnola, and advanced to the succor of Turin. The French were dispirited; and uncertainty and divided councils pervaded their camp. On September 7th, the allied army, with less than half their numerical force, attacked them in their intrenchment, forced their position in every direction, and after one of the severest conflicts ever known, completely defeated them, and raised the siege of Turin. The battle, however, was at one time nearly lost to the allies by an accident which befell Eugene. In rallying a body of Imperial cavalry, the prince's horse received a ball in his chest, fell with the rider, and threw him into a ditch, where, stunned with the fall, he lay for several minutes among the dead and dying. The report spread through the army that he was killed; a general alarm was the consequence; and the infantry were beginning to give way, when, suddenly starting up, Eugene commanded the nearest German regiment to fire upon the French cavalry that were coming up to the charge. The effect was tremendous; the French went to the right about; and, though they rallied again and returned to the charge, the Imperial troops continued gradually to force their way on, till their adversaries fled in confusion. The consequence of this victory was the evacuation of the north of Italy by the French. Eugene was now everywhere successful for some time. He forced the passage of the Col de Tende, carried the French intrenchments on the Var, and laid siege to Toulon. Here, however, he failed; the defence was long and obstinate, reinforcements arrived at the French city, and Eugene, together with the Duke of Savoy, agreed to raise the siege once more, and retire into Piedmont. Eugene was now again called to join Marlborough, in company with whom he fought and conquered at Oudenarde, took Lille (where he was again severely wounded), Ghent, Bruges, Tournay, and Mons; and forced the French lines at Malplaquet, after a severe and long-protracted struggle, in which two hundred thousand men were engaged, and nearly sixty thousand fell. If the victories of Blenheim and Oudenarde might more fairly be attributed to Marlborough than to Eugene, the success at Malplaquet was chiefly obtained by the prince, who had forced the intrenchments, taken the wood of Sart, and turned the enemy's flank, before Marlborough had made much progress against the other wing. Eugene had strongly counselled the battle, though opposed by the States of Holland, and had in a measure taken the responsibility upon himself. On all occasions Eugene's impetuosity led him to expose his person more than mere duty required, and now, having staked his fame on the success of his attempt, he seems to have resolved not to survive a defeat. In the very first attack he received a severe wound behind the ear, which bled so profusely that all his staff pressed him to retire for the purpose of having it dressed. "If I am beaten," replied Eugene, "it will not be worth while; and if we beat the enemy, I shall have plenty of time to spare for that." After some short repose, we soon find Eugene once more acting against the Turks in Hungary. No sooner was war determined, than Achmet III. marched an immense force down to the frontiers of Hungary, to act against Eugene, who had just taken the command of the German forces at Peterwaradin. The Vizier Hali, commanding the Ottoman troops, full of confidence in his own skill, and in his immense superiority of numbers, advanced rapidly upon Eugene, and crossed the Save, which formed the boundary of the two countries, determined to crush his adversary by one great battle. Eugene was as desirous of such an event as the vizier, and therefore the troops were soon engaged, almost under the walls of Peterwaradin. The Turks fought bravely for many hours, and the battle was long undecided; but at length, Eugene's superior skill prevailed, and the enemy fled in every direction. The Grand Vizier struggled to the last, with long and desperate bravery, but after having received two severe wounds, he was borne away by the fugitives to Carlowitz, where he died the next day, muttering to the last imprecations against the Christians. After the death of Hali from the wounds he had received at Peterwaradin, the command of the Turkish army was given to the Pacha of Belgrade, one of the most skilled officers in the Ottoman service. But Eugene was destined to destroy the Turkish power in Hungary. The campaign of the next year commenced with the siege of the often-captured Belgrade; and it was soon completely invested and reduced to sore distress. The Porte, however, was not unmindful of its preservation; and, in the beginning of August, the pacha appeared on the mountains surrounding the town, with an army of near two hundred thousand men. Thus shut up between a strong fortress and an immense army, with the dysentery in his camp, and his forces enfeebled by long and severe labors, Eugene's situation was as difficult as it is possible to conceive. Notwithstanding every disadvantage, his usual bold course of action was pursued in the present instance, and met with that success which is almost always sure to attend the combination of daring and skill. After a short delay, to enable himself to employ all his energies (having been himself greatly debilitated by the camp fever), he attacked the Turkish army in their intrenchments, and at the end of a very short but severe struggle, succeeded in defeating a force more than three times the number of his own. Belgrade surrendered immediately; and the next year, without any great military event, put an end to the war. After the conclusion of peace, Eugene, who had been appointed governor of the Austrian Netherlands, resigned that office, which he had never personally filled, and was appointed vicar-general for the emperor in his Italian dominions. For many years after this Eugene spent his days in peace and tranquillity, endeavoring to raise up a spirit of commerce among the Germans, and to improve the finances of his sovereign, by whom he was appreciated and loved. His greatest efforts were in favor of Trieste, which he changed from a petty town to a great commercial city, and which remains to the present day the best and the noblest fruit of all his talents and all his exertions. 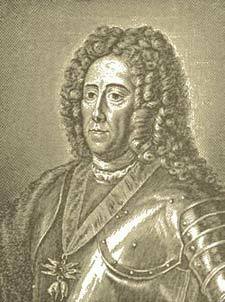 At first, everything promised that the old age of Eugene would have passed in peace, uninterrupted by any warlike movements; but he was once more called from his calmer occupations by the short war which broke out with France in 1733. Perhaps, in point of military skill, the two campaigns which followed were the most brilliant of Eugene's life; but with only thirty thousand men, opposed to a force of double that number, he could alone act upon the defensive. He did so, however, with more success than the scantiness of his resources promised. He prevented the French from penetrating into Swabia; and, though Philipsburg was taken notwithstanding all his efforts, he contrived, by turning the course of the neighboring rivers, to inundate the country on the German side of that city, and to render its possession unprofitable to France. Peace soon succeeded, and with these two campaigns ended Eugene's life as a commander. He lived for some time after this, indeed, amusing himself with the embellishments of his palace and gardens, and employing a great many mechanics and laborers, during all seasons of dearth or scarcity; but the battle-field never saw him more. His health gradually and slowly declined, and on April 21, 1736, in the seventy-fourth year of his age, he was found dead in his bed, after having been slightly indisposed the night before.